For those of you who didn't see my announcement on Twitter or Instagram, I'm pregnant. For those of you who did, we have found out that we are having a little girl. 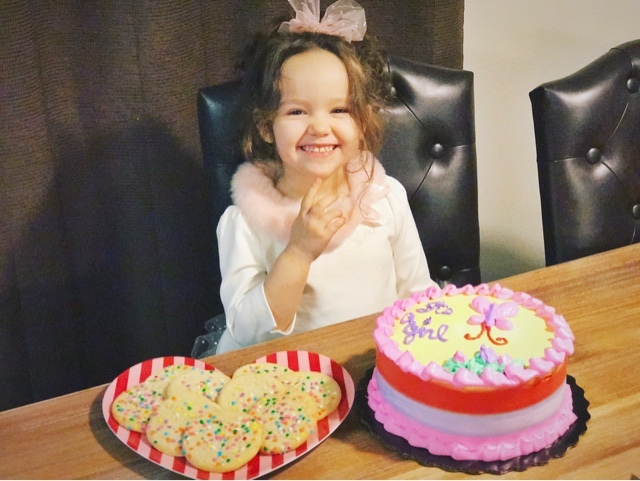 As you can see, Marin is super excited for a little sister (or maybe she's just really happy about the announcement sweets). I haven't really been doing a lot since I found out that I was pregnant, mainly because this pregnancy has been completely different when compared to my first pregnancy.. I have been so sick and tired all the time! Definitely not the easy pregnancy I had with Marin. The morning sickness got so bad that I actually had to take a leave of absence from school, which I was not happy about at all. I am planning on returning back to YouTube soon, which I know I say a lot.. but with no school and more free time, I think this could be a good way for me to get back into the swing of things online. Plus, I always wanted to document my pregnancy with Marin and didn't really get to do that, so pregnancy vlogs this time around sounds like fun. Also, I want to try and write at least one blog post a week, so let's see how that goes. Since I'm taking a leave from school (the driving and chemicals are too much for me right now), I've thought about taking a few online classes. I just hate sitting at home and doing nothing when I could be doing something productive, so I'll be sure to update you all on whether or not online school becomes a part of my life again. Other than that, not much has changed in our lives. We had a wonderful holiday season, spent with our family and loved ones. Thanksgiving dinner was delicious and Christmas morning was full of love and laughs. We had a nice New Year's Eve dinner with friends and rang in the new year with loved ones at home (watching the New Year's Rockin' Eve, of course). I am excited for 2017 and all that this year will bring, I hope you are too! I plan to share all of our adventures and experiences with you, so hopefully this starts with a new blog post next week and a new vlog sometime soon! I love you all and thank you for being in our lives.